Come join us to give Praise, Thanks and Celebrate our hard work and efforts for America. As a young nestling, Isaiah suffered a break in his elbow that did not heal correctly, and left him with a crooked right wing. When time came for the young eaglet to fledge and take his first flight, results proved unsuccessful for Ike, because of his wing injury. His parents could no longer provide the assistance and care necessary for his survival, and Ike was found on the ground scared, hungry and abandoned.For Isaiah, his injury prevented him from flying, and if it weren't for the people that found him, Isaiah would probably have starved to death in the wild. Fortunately the people that found Isaiah were smart enough to take him to a certified licensed wildlife rehabilitator where he could be cared for properly. Through examinations, it was conclusive that Isaiah would never be able to be released back into the wild. It was an exciting day when Isaiah arrived as an Education Ambassador for the Avian Reconditioning Center, as we had been searching for a young Bald Eagle. Ike's absolute favorite time of day is bath-time. He enjoys being showered by a hose, but once he thinks no one is looking, Ike will clumsily make his way into the tub and begin splashing away. It is quite a delight to watch! Head of the Villages Tea Party Aileen Milton with an Elvis impersonator and an Eagle. Members and friends’ spirits were soaring — like eagles — Monday night at the Savannah Center, as The Villages Tea Party celebrated the November election results at its annual pot luck dinner. “Tomorrow is Veterans’ Day,” Aileen continued, “and we are here to pay homage and to thank our military veterans for their service — for keeping our country free. Today is also the 239th birthday of the U.S. Marine Corps.” Villager Lamar Young read a poem, a prayer and led the pledge of allegiance. The group sang ‘God Bless America’ in unison. State Sen. Alan Hays with his wife. Hays, who resides in Umatilla, has been a state senator from the 11th district, which stretches from Ocala to Clermont, since 2012. Born in Henderson, Kentucky, Hays moved to Florida in 1950 and is a dentist. He has been a member of Congress since 2004. Carol and Scott McCorkle, Directors of the Avian Reconditioning Center in Apopka, brought Isaiah, a live bald eagle nicknamed ‘Ike’ to the party. The official Villages Tea Party photographer, Mark Prater, had a lot of takers when he offered to take peoples’ pictures with the large bird for a small donation. 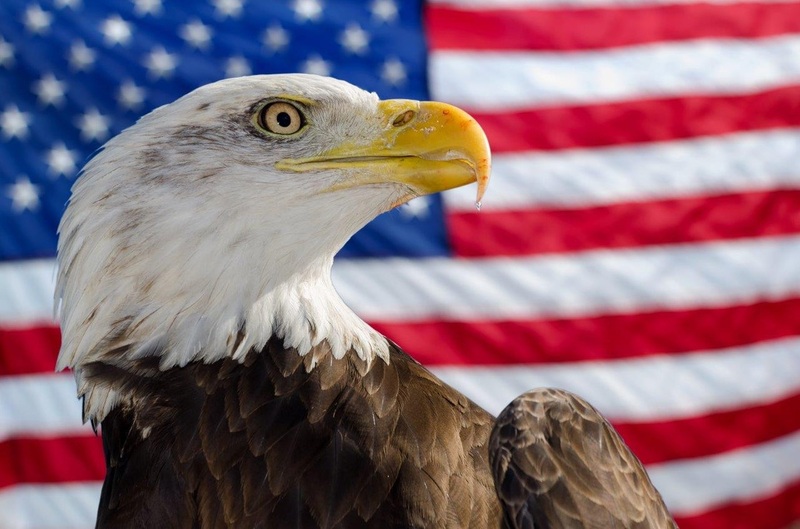 Eagles are both the official bird and official animal of the United States. They build the largest tree nests of any animal species — up to 13 feet deep, more than 8 feet wide, and can weigh upwards of a ton. 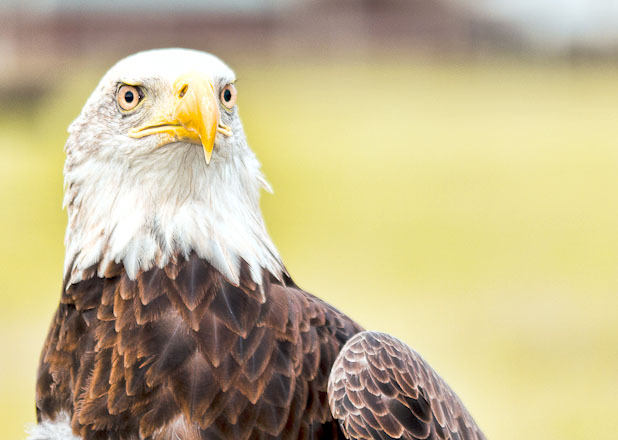 Eagles were found to be on the brink of extinction but recovered. They were removed from the Federal government’s endangered species list in 1995 and removed from the threatened species list in 2007. A thirty year veteran of military service, Joy Selph, from the Village of Duval, enjoyed having her photo taken with Ike. Selph served nine years in the Air Force and 21 years in the Army. She carries ‘Buffy,’ a chihuahua, with her wherever she goes. Buffy is her post-traumatic stress disorder (PTSD) therapy dog. Mallory Square Villager, Elaine Mysliwiec, enjoyed the evening. She served in the U.S. Navy nurse corps. for 2 1/2 years and as a flight nurse in the U.S. Air Force an additional 22 years — with tours in the Vietnam and Gulf Wars. The Villages Tea Party Core Values include fiscal responsibility; Constitutionally limited government; free markets, and individual freedom. For more information, visit the villagesteaparty.org.